Catch all of the dino-charged adventures when Nickelodeon’s iconic, 23-years-running “Power Rangers” TV series returns with Power Rangers Dino Super Charge: The Complete Season, arriving on DVD and Digital HD on June 27 from Lionsgate. The Power Rangers must battle an evil intergalactic villain in this action-packed franchise that remains one of the top-rated and longest-running children’s live-action series in TV history. 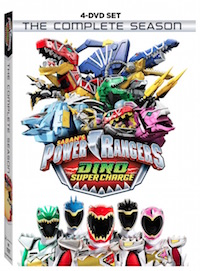 Including four discs with over four hours of action, the Power Rangers Dino Super Charge: The Complete Season DVD will be available for the suggested retail price of $19.98.